After a political scandal, fledgling lobbyist Dempsey Jo Killebrew is left almost broke, unemployed, and homeless. She reluctantly accepts to refurbish Birdsong, the old family place in Guthrie, Georgia. But, oh, is Dempsey in for a surprise. "Bird Droppings would more aptly describe the moldering Pepto Bismol pink dump. There's also a murderously grumpy old lady who has claimed squatter's rights and isn't moving out. Ever. Ella Kate is the old lady, and she is quite a character. She reminds me of the Granny in The Beverley Hillbillies, a lot of grumpiness but a good heart under it all. Dempsey has been really sucked in by her boss and blamed for something she had no idea she was involved in. In Guthrie she meets two lawyers father and son, who are kind and helpful. While in this town just about everyone knows what has happened before it happens, she finds support and begins to grow a backbone in adversity. The FBI get involved and are interesting minor characters. They also assist Dempsey in trapping her now previous boss into being found out. 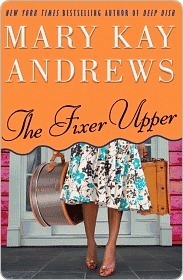 This was my first read by this author, I enjoyed it, I think I would file it more under women's fiction than romance. There is a relationship but it is not to the forefront, although naturally it plays its part. It reminded me of some of the books by authors like Emilie Richards or Wendy Wax or some of Susan Mallery's books.